Russia has followed Georgia in signing a French-brokered peace plan for ending their nine-day-old conflict. But Foreign Minister Sergei Lavrov said the withdrawal of Russian forces from deep inside Georgia depended on extra security measures being put in place. He said Russian forces were encountering "problems caused by Georgia", and refused to put a timetable on their departure. 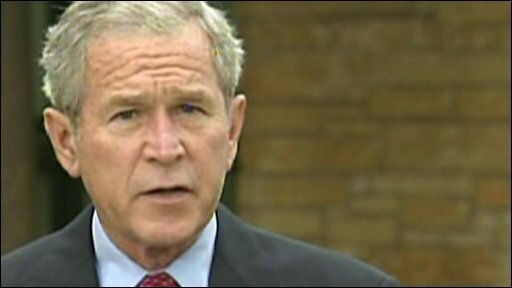 US President George W Bush again demanded Russian forces withdraw. A simmering conflict between Georgia and Russia erupted on 7 August when Georgia launched an assault to retake its Russian-backed separatist province of South Ossetia. It led to a massive counter-offensive by Russia, with Russia moving deeper into Georgian territory. Scores of people have been killed by the fighting and tens of thousands displaced. US-backed Georgia has vowed it will not accept any loss of its territory, but Russia insists that following the recent violence, residents are unlikely to want to live in the same state as Georgians. The future of another breakaway region, Abkhazia, is also at stake. Georgia's foreign ministry said on Saturday that Russian-backed separatists from the province had seized 13 villages and a power plant within Georgia. The claim could not immediately be independently confirmed. On Saturday Russian President Dmitry Medvedev followed his Georgian counterpart, Mikhail Saakashvili, in signing the truce. Among the six points in the agreement, both sides agree to pull back their forces to pre-conflict positions. But reports say the agreement contains a provision that allows Russia to implement additional security measures on a temporary basis ahead of the arrival of international ceasefire monitors. Russian Foreign Minister Sergei Lavrov told reporters it was these security measures that would be implemented "first and foremost". Diplomats have said that the UN Security Council is expected to vote this weekend on a draft resolution formalising the ceasefire agreement. Russian forces are now far beyond South Ossetia's borders in Georgian territory. They are reported to have occupied the central town of Khashuri, giving them control of all but one of the major towns on the highway across Georgia from the Black Sea to the capital Tbilisi. And the BBC's Gabriel Gatehouse puts them within 35km (22 miles) of Tbilisi itself. He says they do not look like they are pulling out - and in fact seem to have dug in. The US has called a number of times for Russian forces to leave its ally's territory, and President Bush repeated the message from his ranch in Crawford, Texas, on Saturday. He said Mr Medvedev's signing of the truce was "hopeful", but that there could be no question that South Ossetia and Abkhazia would remain within Georgian borders - borders that were internationally recognised. There was "no room for debate on this matter", Mr Bush said. President Saakashvili signed the ceasefire agreement on Friday, after a meeting lasting more than four hours with visiting US Secretary of State Condoleezza Rice. Reports suggest Mr Saakashvili only reluctantly agreed to another of the plan's clauses - international talks about the future status of South Ossetia and Abkhazia. After the meeting he launched a bitter attack on Moscow, calling Russian troops "21st Century barbarians" and accusing them of war crimes. 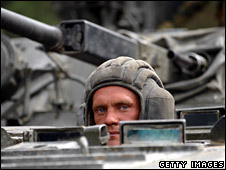 He criticised the West for not granting Georgia membership of Nato, saying it could have prevented the fighting. Russia argues its forces are there to ensure civilians face no threat from Georgian troops. 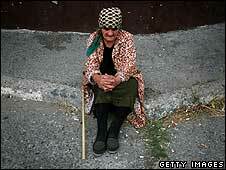 South Ossetia has had de facto independence since the end of a civil war in 1992.